Tankless hot water heaters work on a very straightforward plan: the heater turns on when you open the faucet and turns off when you close it. You heat only the water you actually use. A tankless hot water heater looks like a box or a medium suitcase sitting in your hot water line. The heater gets mounted on the wall, often in the same location as the old storage type heater. When you open the faucet, cold water enters the heater and the heater turns on. Because the volume of water in the heater is small and the heating unit is powerful, the water is heated instantly. Hot water flows out of the heater and travels to the faucet. As long as there is a demand for hot water, cold water flows into the heater and hot water flows out. An adjustable thermostat controls the temperature of the water, and the length of pipe between the heater and the faucet determines how quickly the first hot water arrives. A common misconception is that a tankless water heater provides hot water instantly at the faucet. This is not true. The length of the pipes from the heater to the faucet determines how long you must wait for hot water to flow out of the faucet. Because the water is heated continuously as it flows through the heater, the supply of hot water from a tankless heater is unlimited except by the flow rate of the heater – and a standard tankless heater can provide more than 250 gallons an hour at 120 degrees. Compared to a standard residential storage tank style water heater, which will provide about 70 gallons per hour, it is easy to see why tankless water heaters are so popular now. In 99% of the installations, a single gas-fired tankless heater can provide enough hot water for your entire house. 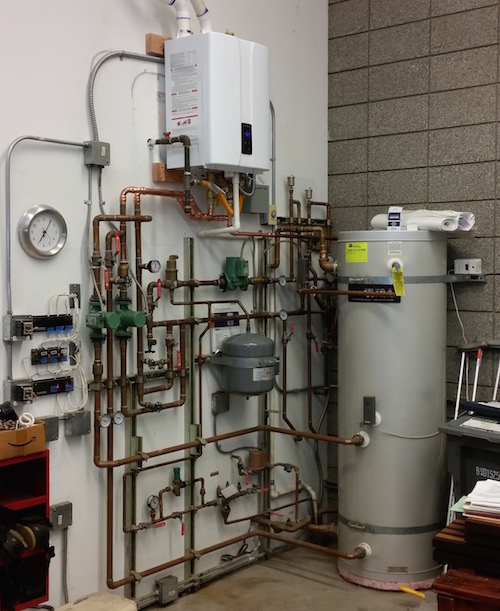 Because tankless water heaters heat only the water that is being used instead of holding a reservoir of water at high temperature, they are very energy-efficient. And the small size of the heater can free up space you would rather use for other purposes. Whatever your HOT water needs, there’s a tankless water heater to fit the bill.